Size of Female: 45-50 lbs, 18-22 in. The Harrier dog is like a smaller version of the English Foxhound and a larger version of the Beagle. They are considered one of the mid-sized breed of dogs and measure from 19 to 21 inches to the shoulder. An adult Harrier dog weighs between 45 and 60 pounds. Their ears are hanging, they have short hair and come in a variety of colors. They have a muscular constitution and are hunting hounds. These dogs have large bones to impart stamina and strength. They have a broad skull with a large square muzzle. The tail is of medium length and stands tall but is not curled at the end. There are conflicting stories regarding the origin of the Harrier dog breed. One theory states that the breed is a cross between the Bloodhound, the Basel hound and the Talbot hound. 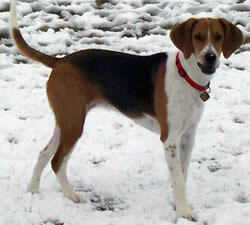 Another theory says they are a cross between the English Foxhound, the Greyhound and the Fox Terrier. Yet another stipulates that they are a downgraded version of the English Foxhound. The first pack of these dogs was created by Sir Elias de Midhope around 1260. Subsequently, this hound breed flourished as a hunter. The Harrier dog is more outgoing and playful than the foxhound and is tolerant, sweet-tempered and cheerful in nature. It is wonderful with children and is an excellent dog to have in a pack, but they need to be supervised when kept with other non-canine pets. These dogs love to hunt, sniff, explore, roam and go on trails. They are a very watchful and determined breed and require firm and patient training. There are two distinct variants of this dog breed: the field line, which is suited for hunting and trailing, and the bench line, which is more suited for dog shows. Living Environment – The owner of this breed should be an active dog lover and the dog is best suited for the rural environment. The sick, elderly and the disabled will have trouble managing the high energy levels of the dog. They are best suited for a rural home with a fenced yard. Grooming – In the grooming department, this dog is an average shedder and the only grooming required is an occasional combing and brushing to remove dead hair. The ears must be kept clean and the nails well-trimmed. Diet & Exercise – Their diet should comprise of lean meat, carbohydrates and an ample amount of protein. These dogs are not meant for a life in an apartment. They need to be taken out for daily jogs or long and brisk walks. The human must always be the leader and keep the dog by his side or be ahead of the dog. It is a highly energetic breed and needs regular exercise. Health – This breed has a healthy and robust constitution. However, some of them have been found to be prone to epilepsy and canine hip dysplasia. The Harrier dog needs a patient trainer and can be excellent watch dogs. They are not good guard dogs as they are very friendly with people. They may prove to be stubborn and independent, thus impeding the dog training process. Positive dog training is recommended.